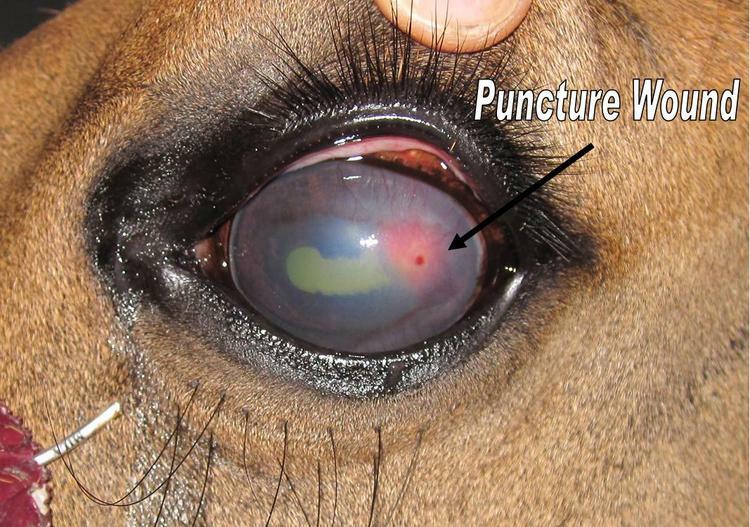 Ulcers, Puncture Wounds, Uveitis, and Infections. 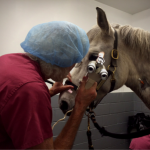 At Mid-Rivers Equine Centre, we offer ophthalmic medical care to ensure the eye health of your horse. 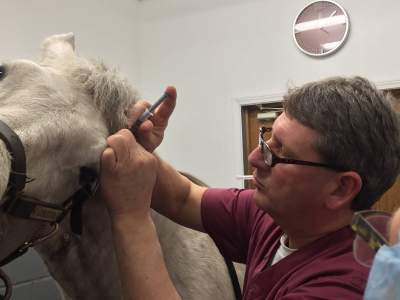 From equine eye exams to diagnosing complicated equine eye issues associated with trauma, disease, old age, or infection. Eye trauma: Trauma caused by injury or foreign objects in the eye that can cause lacerations. Moon blindness (uveitis): A painful eye disease that causes inflammation of the uvea. Cataracts: A clouding of the eye’s lenses that can be caused by injuries, infection, or inflammatory eye diseases like uveitis. Corneal ulcers: A painful condition that can be formed after injury to the eye and prone to secondary infection by fungi or bacteria. Dermoids: A rare eye disease characterized by growth of skin tissue on the cornea or conjunctiva. Entropion: A condition when the eyelid folds inward and rubs against the cornea. Melanoma: Tumors caused by the cells that produce skin pigment that can be benign or malignant. Glaucoma: An eye disease causing damage to the optic nerve resulting in impaired vision and potential blindness. In addition to diagnosing and treating these conditions, we can also perform surgeries like eye removals (enucleation), conjunctival flaps, and implants to control uveitis and immune mediated keratitis. 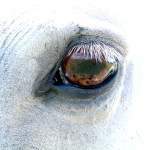 If you believe your horse is experiencing eye problems, call your veterinarian. If it is an emergency, don’t hesitate to call us 24/7.